Great all-solid wood tone with Fishman Sonitone electronics presented at an incredible price. Martin’s Road Series line of guitars features a blend of the legendary Martin tone, with solid-wood construction, and lightning-fast playability. 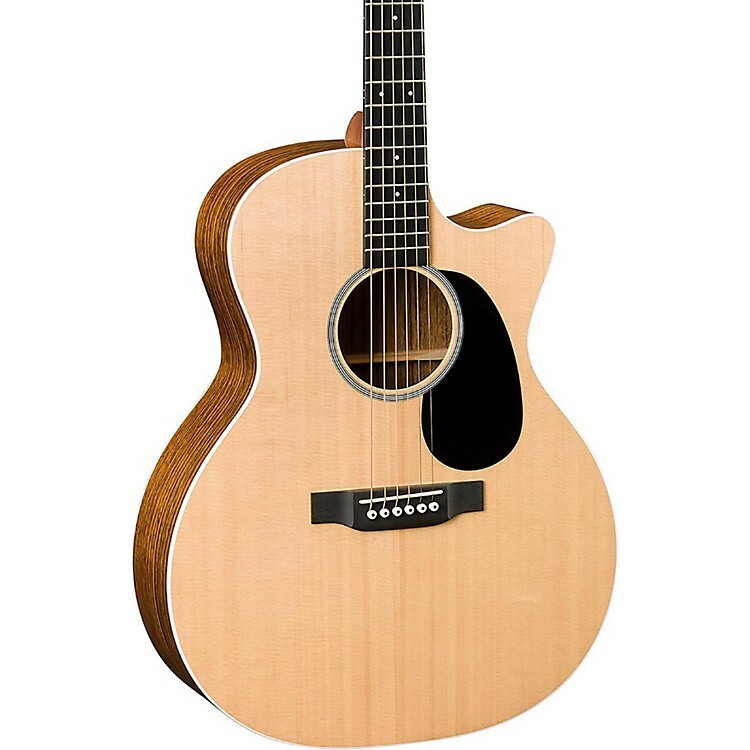 The Martin GPCRSG Grand Performance Acoustic-Electric Guitar was designed for the player that is searching for incredible tone, playability, and visual appeal at an affordable price. Its all solid-wood construction produces a tone that will rival some of the most expensive guitars made today. To start with, Martin selected a solid Sitka spruce top as the basis of the tone engine. Martin selected Sitka spruce because it’s a very expressive tonewood that produces the right amount of tone, volume and dynamics. To augment the crisp tone of the Sitka spruce, the back and sides is fashioned of solid mutenye, a tonewood that adds the perfect amount of character, combining the right amount of warmth and definition to the mids and highs. Unlike laminate or layered woods that are stiff and lack bottom end and resonance, a solid wood instrument has crystal-clear highs, a punchy bottom end, and lots of sustain. Martin’s GPCRSG Grand Performance features an all polished gloss finish. It not only sounds great, but it looks like a million bucks! It is designed using Martin’s innovative Grand Performance body. The GP body was designed to be a little deeper than your typical 000 or auditorium-shaped body. The added depth gives you an increase in volume, while producing an even tone across the entire musical spectrum. The combination of solid tonewoods and beautiful cosmetic appointments body produces an instrument that is extremely expressive and dynamic. You won’t be overpowered at a jam session when playing this guitar. The GPCRSG Grand Performance's great sound and fast action is perfect for the singer-songwriter, stage performer, session player, and aspiring guitar student. Playability is a must for many of today’s musical styles and Martin got you covered. The GPCRSG Grand Performance has one of the most comfortable necks on the market. The cutaway body and slim neck profile lets you glide across the fingerboard with ease. You will be able to make a smooth transition from your electric guitar to this acoustic. And, as an added bonus, the GPCRSG Grand Performance is precision setup by one of Martin’s Plek machines. As one of the last steps in final setup process, Martin uses the Plek machine to give you the ultimate guitar setup. If you were to have a technician Plek one of your guitars, it would cost you anywhere from $250-$400. Martin includes this valued bonus on every Road Series guitar for free. If you’re a fingerstyle player, professional, novice, or singer songwriter, you are going to love the way this guitar sounds and plays. The Martin GPCRSG Grand Performance comes complete with Fishman Sonitone electronics. This compact, easy-to-use electronics package lets you plug in and play. There’s no need for you to spend hours getting a great guitar sound. Just plug in, and you’re ready to go. For easy access, the volume and tone controls are positioned directly in the soundhole of the guitar. This gives you the ability to make changes to your tone in real time. This guitar uses Martin long-lasting SP Lifespan Phosphor Bronze Medium Gauge and comes complete with a 12C0061 hardshell acoustic guitar case. Take the road with this Road Series Martin. Order today.